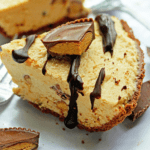 Deliciously simple Frozen Peanut Butter Pie, the perfect icebox treat for a hot summer filled with rich peanut butter and whipped cream flavor and chopped peanut butter cups. In a small saucepan, combine 1/4 cup of the cream, the peanut butter, and 1/4 cup of the powdered sugar. Cook and stir over medium heat until smooth. Cool to room temperature. Meanwhile, in a medium bowl, combine the remaining 2 cups cream and the remaining 3/4 cup powdered sugar. Beat with an electric mixer on medium speed until stiff peaks form (tips stand straight). Fold peanut butter mixture into whipped cream. Fold in the chopped peanut butter cups. Spoon mixture into pie shell. Top with the halved peanut butter cups. Freeze about 3 hours or until nearly firm. Makes 12 servings.